Because of ICYNENE's® superior insulating power, airtight closed-cell formulation, and simple spray-on application, its uses in an agricultural setting are virtually limitless. 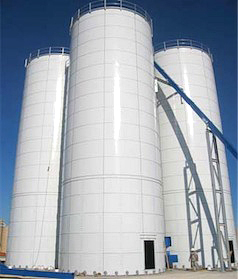 Here are a few ways ICYNENE® can be used to cut your costs:	Liquid Storage Tanks ICYNENE® can be sprayed directly on vertical or horizontal tanks of any shape, making it an excellent choice for insulating tanks and storage vessels for liquid materials such as water, fats and oils, and slurries. It can also be applied for insulating processing tanks used in the beverage and spirit processing industries. Cold Storage and Freezer Applications ICYNENE® can be used in the design and construction of cold storage and freezer facilities used to store fruits and vegetables, nuts and other perishable food items. It helps assure constant temperatures and the closed-cell design means much lower water vapor perm values per inch. It's also an excellent insulation for processing plants, refrigerated warehouses and distribution centers. Metal Buildings, Pole Barns, Sheds and Structures ICYNENE® is an excellent choice for the farm or ranch to insulate various types of out buildings such as workshops, equipment storage, bagged or bulk feed storage and general use type structures. It will help keep work areas comfortable in winter or summer, and will actually "tighten" a building constructed of metal panels and add to its structural integrity. It also reduces interior noise levels. 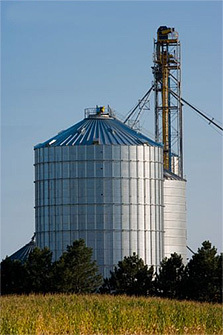 Grain Storage and Silos ICYNENE® can be used to help control dust and moisture problems experienced around grain and animal feed storage by sealing cracks and seams along exterior and interior bin bottoms or tops. It also helps reduce insect migration and can conserve heat during drying. It provides an airtight seal that reduces waste during fumigation of grain storage facilities. 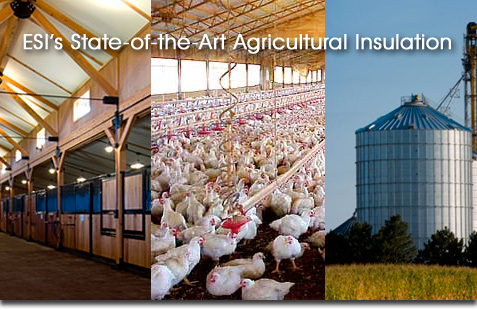 Livestock Housing ICYNENE® can be used to insulate dairy barns or milk houses, swine holding or farrowing houses, horse barns, and cattle barns. It provides consistent temperature control to reduce stress levels in livestock caused by temperature extremes during summer or winter months. It can also be used to reduce radiant heat under sheds and covers during summer months. Poultry Houses ICYNENE® can be used in existing houses, new houses or for retro-fit projects. It is a superior choice for solid or curtain wall designs. By eliminating air infiltration, it can increase tunnel fan operation. It can also improve the structural integrity of older style houses. ICYNENE® can be formulated and applied in "Black" for providing blackout conditions.